The Awards Ceremony for the Never Such Innocence 2016/17 Poetry, Art and Song competition took place on the sunny afternoon of Thursday 25th May 2017 at The Guards Chapel, Wellington Barracks. Children travelled to the event from all over the world – the first place winner of the age 9-11 art category, Leong Tong Yan, flew to London from Malaysia to collect her prize, and second place winners of the age 11-14 and 14-16 art categories Yiwei Ni and Jude Derla both flew from Canada to join us. We were therefore delighted that the Malaysian Defence Advisor, Brigadier General Kamarol, and Assistant Defence Advisor Lieutenant Colonel Ahmad Rashidi Ithnin were with us to support their winner and award her prize. On the morning of the event, Colonel Rory Radford of the Canadian Defence Liaison welcomed the two Canadian winners to the High Commission in Trafalgar Square, and then accompanied them to the ceremony to present their awards. 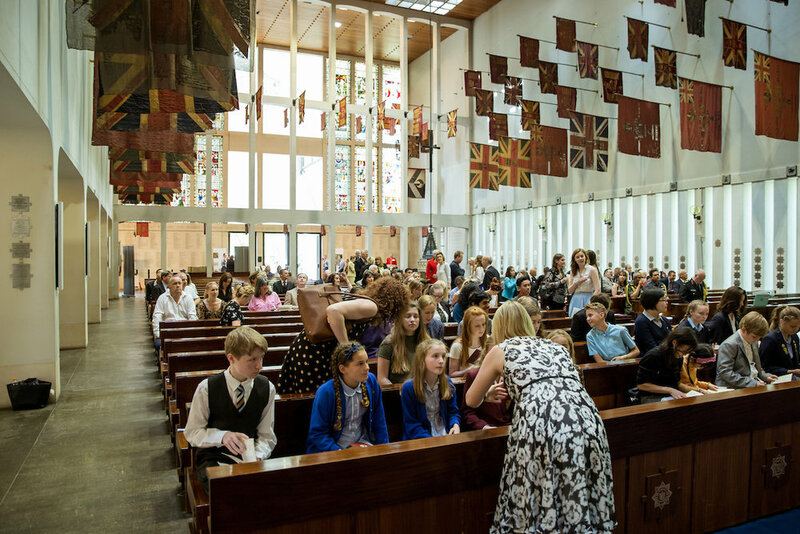 The children and guests were greeted by members of the Lord Lieutenant’s Army Cadets, the Sea Cadets, and the Air Cadets, before Reverend Stephen Dunwoody began proceedings. 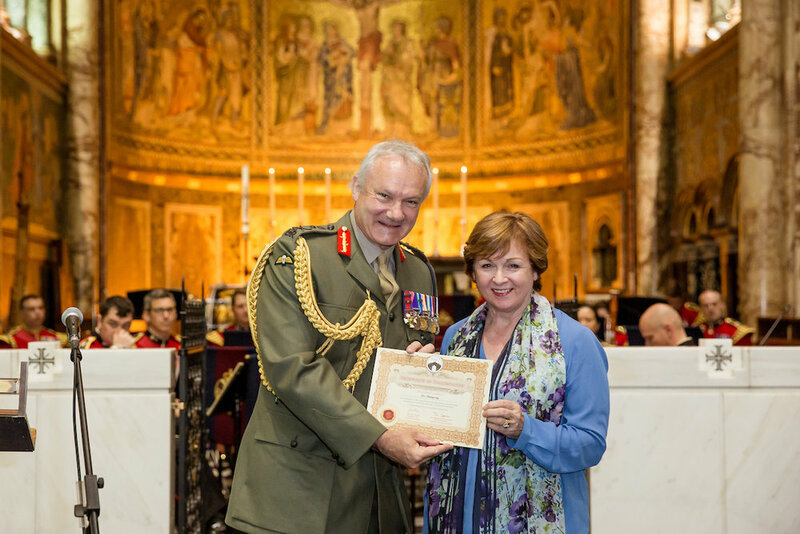 Our Founder and CEO Lady Lucy French gave a short speech about Never Such Innocence before inviting Vice Chief of Defence Staff General Sir Gordon Messenger to award the children their prizes. The first place winner of the age 9-11 poetry category, Rebecca Farnfield, read out her beautiful poem I Stand Alone, in front of all the guests. Winner of the Gaelic competition Hamish Scott also read his poem Dà bhalach as an Eilean (‘Two Boys on the Island’). During the awarding of the age 11-14 art category Lady Lucy and General Messenger presented children from Hampton School and their teacher Karen Williams with a Special Commendation for their beautiful prints inspired by Paul Nash. The poetry prizes for this age group were then awarded, and the first place winning poem, Why?, by Erin Longley, was read for the guests by the Rt Hon. Earl Howe, Minister of State for Defence. After Earl Howe and General Messenger had awarded Erin her prize, Mari Wyn Jones, winner of the Welsh poetry competition, read her poem Yr Enaid Byw (‘My Living Soul’). Lady Lucy and General Messenger then moved on to the age 14-16 category, which included a Special Commendation for a group entry from St. Vincent’s School for their beautiful ceramic poppies – one of which has been a talking point at many NSI roadshow events all over the British Isles, being frequently worn by Lady Lucy. The age 14-16 poetry category was won by Hannah Owens from Jersey College for Girls, and one of the poetry judges Dr Viv Newman read Hannah’s incredible poem Dear Ivy for the guests. The final award of the ceremony was for Lara Vujasevic, who sang her song, Fighting On My Own, accompanied on guitar by NSI Artist in Residence Marty Longstaff. Lara rose to the occasion and sang beautifully. Marty then led the guests in a rendition of Boy Jack, a song written with students from The Harbour School in Portsmouth about 15-year-old Jack Cornwell, youngest ever recipient of the Victoria Cross. The winners then left the chapel and formed up into ranks behind the Band of the Welsh Guards. The band and the winners marched across to the Officers Mess, resplendent in the sunshine. 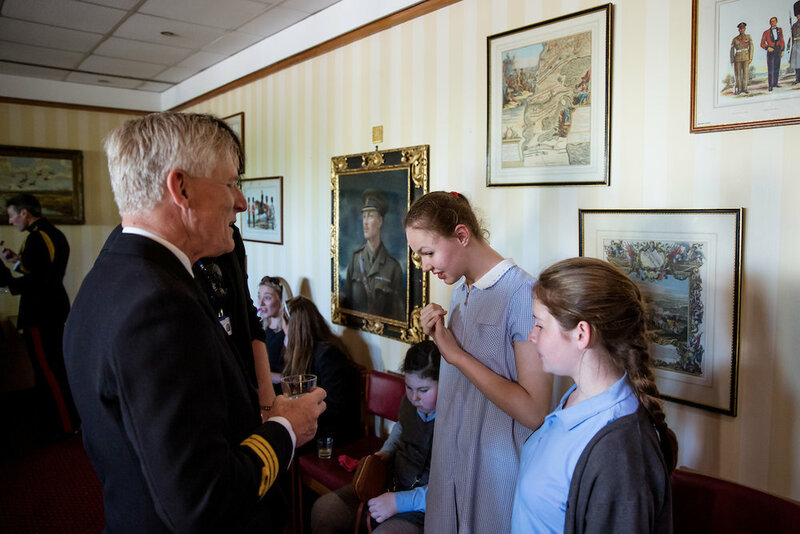 There was then an opportunity to relax in the Officers Mess, and winners and guests enjoyed refreshments together. This allowed our judging panel to meet the winners they had selected, and congratulate them once again. Francesca Clarke of Portsmouth High School, who came third in the age 9-11 poetry category, also met the Lord Mayor and Lady Mayoress of Portsmouth who came to support her. Authors Sarah Ridley, Hillary Robinson, Martin Impey, Viv Newman, and Michaela Morgan were also able to congratulate in person those runners-up who had received their signed books as prizes. All winners and guests took away a copy of the 2016/17 Winners’ Booklet, which showcases the winning work, and can also be downloaded here.